The All-Ireland Uneven age and Novice Cross Country Championships took place on Saturday. Storm Deirdre did not deter our athletes who braved the elements to race against the best in Ireland. Four athletes travelled to Navan racecourse where the conditions were wet and windy. 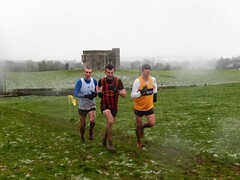 The underfoot conditions were heavy and wet however the course provided some exhilarating performances. Our first athlete on the course was Tomas Cussen. Tomas ran very well in the Boys U15 event to finish 137th. Following this performance we had three of our Senior athletes run in the Novice Ladies event. Angela Fogarty, Lorraine Healy and Louise Fogarty completed two 2k laps along with four other Tipperary Ladies. Angela was our first athlete to finish in an excellent 50th position. Lorraine followed Angela in 86th position and Louise finished in 105th position. Well done on the excellent achievement and for representing the club on such a high level. Thurles Crokes on Sunday 9th December. Moyne AC had 10 teams competing on the day and came home with two sets of bronze medal. Aaron McLaughlin represented Tipperary in the Boys 1km race in the National Championships on December 8th in St. Anne’s Park, Raheny. He finished in a fantastic 3rd position in 5.38. Congratulations to him on this wonderful achievement! Club membership registration is currently under review and details of these changes will be communicated at upcoming trainings and online. Registration is due by the end of the year and registration forms are available at the clubhouse. This year our Christmas morning mile will start at the earlier time of 10:30 and finish at 12pm. This is a great social event where participants of all abilities can join together to walk or run four laps of the track. Times are available to participants. The proceeds of the event will go to the charity ‘Heart to hand’. The charity was set up in 1991 to provide food to homeless shelters, soup kitchens, homes for the elderly, people with disabilities, resource centres, homes for distressed women and families, alcohol awareness centres, drug rehabilitation centres, youth centres & many more deserving organisations around Ireland. All donations are gratefully accepted.